The siege of Taiz has entered its eighth month against the backdrop of worsening conditions in the Yemeni civil war and its regional repercussions. Geneva 2 not only failed to bring relief to Taiz. There are rebels in the delegation of former President Ali Abdullah Saleh who would like to see that city burnt to the ground. Abdel Aziz Al-Majidi, editor-in-chief of the Yemeni Al-Shahed newspaper, is a prominent young political activist who, before the civil war erupted, founded the Madd movement to counter the southward march of Houthi insurgents. From the heart of Taiz, where he lives, Al-Majidi relates to Al-Ahram Weekly scenes from his annals of warfare and a city under siege. The siege of Taiz is now in its eighth month. Why has this battle not been resolved yet? The battle of Taiz is complex and multifaceted. It has military as well as geopolitical dimensions. Taiz carries a unique demographic weight in Yemen. It is the country’s most educated province and it was the starting point for the February 2011 revolution that forced Saleh out of power. Ali Abdullah Saleh has a personal feud with this city. This is why he amassed several of his regiments against it along with the Houthi militias and their thousands of fighters. There are thousands from Saleh’s troops driven out of the south and redeployed in Taiz. All agree that liberating Taiz will open the road to Sanaa and the fall of the other provinces. But there is another reason that makes the Saleh/Houthi alliance so dead set on reclaiming Taiz. After their forces were driven from the southern provinces, the Saleh/Houthi alliance hope to unilaterally declare a state in the north. They are counting on a scenario in which the southerners lose patience and declare their own state. This is why the insurgents have dug in their heels in along the border strip. As we have observed, the fighting has not budged from the former border strip between the south and the north. But more worrisome to the Saleh/Houthi forces is the prospect of a victory of the Taiz people over them and the ramifications this would have for other Yemeni regions. Historically, the areas of the Zeidi north have regarded Taiz and the other Shafei regions in Yemen as part of their territorial possessions on the basis of the claims of the Imams who had controlled the country for many long eras. They believe themselves entitled to rule. Therefore defeat at the hands of this province would make them feel threatened and would encourage all the other provinces to rise up against them, as occurred in the revolution. There is another important point connected to the Arab coalition. There are assessments that suggest that the coalition has deliberately turned Taiz into an attrition zone for Houthi/Saleh forces. The idea involves luring a large portion of their forces here so as to facilitate the [coalition’s] march to Sanaa via Mareb and Al-Jawf. There are military and field developments in this respect. Troops from the national army and the people’s resistance are at the outskirts of the capital, only some dozens of kilometres away. As an eyewitness to the annals of warfare and siege, what is your estimate of the scale of the siege and the extent of the suffering? 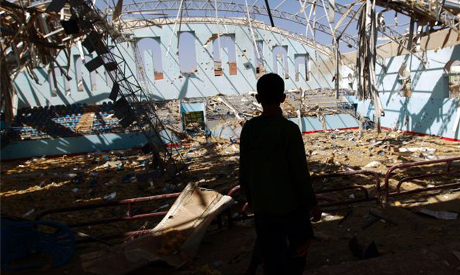 Taiz is in the grips of a humanitarian disaster by all standards. It is on its way to becoming another Syrian Madya. Both are surrounded by militias supported by Iran and carrying out its sectarian agenda in the region. According to medical reports, children, women and the elderly have died due to the lack of oxygen [in hospitals]. There are patients suffering from diabetes, kidney failure and other diseases who required regular medical attention and medicine but who died because the medicines were unavailable. The militias have prevented medical and humanitarian relief shipments from entering the city. Doctors Without Borders has also been unable to send in aid to civilians. The same applies to the International Red Cross and the World Health Organisation. All these organisations have been prevented from entry. The siege is now in its eighth month, but the UN and the world stand by and watch, deaf to the cries of hundreds of thousands people under siege. Massacres occur on an almost daily basis. Random bombardment has left around 1,600 people dead and 8,000 wounded. About a third of these are women and children. Hospitals are bombarded daily. Doctors and first aid workers have been killed while trying to carry out their humanitarian duties. There is a real humanitarian tragedy in Taiz, but the world is not paying attention. What is your impression of the role of the UN ¾or more precisely the UN envoy ¾with regard to Taiz? Sadly it appears that the UN is promoting a basic idea with regard to all conflicts in the region. This is to allow things to go from bad to worse, making it more and more difficult, if not impossible, to rein in the conflict and cement countries back together again. The UN is a stage for cheap spectacles that show the bad side of the policies of major powers. We, in Yemen, have a clear international resolution. It condemns the insurgency and the militias and it calls for their withdrawal from the cities, the handover of heavy weapons to the government, and, before this, the release of kidnapped persons. That resolution was issued under Chapter VII of the UN Charter, which means that in the event of noncompliance, armed force should be brought to bear to subdue the insurgents and enforce the resolution. Instead, the UN and its envoy have turned into facilitators of violations. Indeed, they have sometimes been accomplices by supplying financial resources to the rebels due to their insistence that all assistance be sent through ports and airports controlled by the militias. There have been dozens of reports on how those militias trade in assistance packages and sell them on the black market. Tens of thousands of tons of petroleum derivatives and twice this amount in food and medical relief have been sold off and the revenues used to fend their war. The position of the UN has been clearly complicit with the militias. Do you think that the postponed Geneva talks will bring anything new on the ground in the event they resume? No, I do not think the next Geneva round, if it takes place, will bring anything new. There is no sign of a breakthrough and even if one did occur it would only be a kind of dodge in order to gain time and to try to turn the tables against the legitimate government. I do not believe that the matter is primarily contingent on the will of the Houthis and Saleh. The decision of war and peace lies with Tehran. We have seen how they sent their intelligence men to Geneva 2 to stall the talks for an entire day. In spite of the fact that all parties had signed the agenda for the talks, they insisted on bringing up points that had presumably been settled, such as the question of them being represented in a single delegation along with Saleh. Then there was the question of confidence building measures. All they wanted was to obtain a ceasefire resolution. Which for them means a halt to the coalition’s aerial bombardments, while they continue to stroll about and amuse themselves, as always, on other combat fronts. In your opinion, why did the Houthis threaten to burn down Taiz? As I said, the militias want to take revenge against Taiz. This would satisfy an instinctive thirst that Saleh and the Houthis have in common, especially since it was Taiz that aborted their coup project and prevented the bid to seize power again on the part of a sectarian group with a contemptible tribal, regional and racist outlook that conflicts with the dreams of all Yemenis for a citizen’s state in which there is equality, justice and equal opportunity for all. But at the same time, it is to carry out the Iranian scheme to create more social and sectarian rifts in Yemen by trying to turn Taiz province into a symbol as a “Sunni stronghold”. Do you think that the Arab coalition will be unable to settle the battle on the ground, and therefore that a political solution is preferable? Or should the battle be resolved militarily? What has happened during the 10 months of Arab intervention is an unmitigated success. The legitimate authority that had been driven into exile now controls more than 70 per cent of Yemeni territory. We have to take into consideration that everything has to be rebuilt from zero. All the security and intelligence agencies and the army are loyal to Ali Abdullah Saleh, not because he is a beloved leader but because in his 33 years in power he built up those agencies on the basis of family, regional and sectarian affiliations. More than 90 per cent of those agencies and the army belong to Saleh’s tribe, region and other regions geographically belonging to the Zeidi sect. This has historical roots connected with those regions’ hegemony over Yemen and the determination of all successive rulers to control the military and the security agencies. This was the practice that prevailed at the hands of the (Zeidi) Imams until the 26 September revolution. The military solution, if painful, is the ideal solution in the Yemeni case. But it requires stamina and special attention to Yemeni tribal composition. It can be carried out with more expert planning and by working on the ground in a more organised way. Today, the national army is on the outskirts of the capital. Such advances can contribute to a definitive military solution that, in turn, will spare the region new jolts in the future as a consequence of a partial victory. A political settlement ¾if there is scope for one, which is unlikely given conditions on the ground, even if as a kind of dodge that would implement the UN resolution in form only ¾will give Iran the opportunity to reproduce its role and we will find that Yemen has become another version or an approximate version of Lebanon. There is no room for settlements that re-partition the country into zones of influence. That is a destructive route that will lead us back to square one, and it will seem that the Arabs have lost everything, economically and geographically. How do you perceive Iranian regional policy and its undisguised conflict now in Yemen and other areas? To what extent has this policy reflected itself in the Yemeni crisis? Iran has been present in Yemen since the outset of the 1980s, which is to say since less than a year after the Khomeini revolution. It wove relations with Zeidi religious authorities. Although this sect is closer to Sunni Islam, Iran ranks it within the broader Shia sphere. Iran has exploited the secret ambition of those authorities to regain what they see as their divine right to rule. I refer to what is called the Hadawiya doctrine to which some of them subscribe. This is the Zeidi doctrine that prevailed in parts of Yemen since Yahya Hussein Al-Rasi from the Hijaz arrived in Sada in 284 AH and stipulated that rule should be restricted exclusively to the descendants of Al-Hassan and Al-Hussein. Unfortunately, Iran was able to operate in a vicious Arab political vacuum that arose due to the lack of a collective project that rallied the Arabs together. Hopefully the Arab coalition will be the kernel of a joint Arab effort that will obstruct Persian hegemonic designs. Iran does not care about Shia Arabs. In fact, deep down it hates them. Therefore it sets Arabs against each other ¾Sunnis against Shias ¾in order to achieve its project of regional hegemony as a Persian empire. It deceives them and cajoles them, but when the moment of truth comes it will sacrifice them and abandon them to their tragedy. It is carrying out a scheme to re-partition the region on sectarian and ethnic bases. Many studies have been published on this, the most famous being that of the American, retired General Ralph Peters, which appeared in the Armed Forces Journal in 2006. Entitled “Blood Borders”, it presented a concept of how the regional map should be redrawn on the basis of ethnic, sectarian and tribal lines. At the heart of the torn up map are we Arabs. What scenarios do you envision for the future of Yemen? I believe that Yemen stands at a crossroads. On the one hand it could move in the direction of the military solution. This will require some time and patience, but it will spare the region considerable anxiety and unrest in the future, especially if that group is socially isolated and an Arab Marshal Plan is set into motion for reconstruction with a focus on developing tribal areas. The second option is to revolve in place with military operations that do not bring a resolution. This will lead to a decline in Arab support, if not withdrawal, while precautions are taken to safeguard certain border areas to protect Yemen’s neighbours. This will leave Yemen to drown in the vortex of endless civil war. But the dangers of this will be great and the consequences grave, as a country like Iran, especially after the lifting of sanctions, will be able to rebuild the power of its militia network and thus plunge Yemen into a sectarian war such as that in Iraq. This attrition will drive the south into determining its fate on the ground and unilaterally declaring a state to seal the status quo. But ultimately, the whole region will plunge into endless upheaval that will not end at Yemen’s borders. In the third scenario, the international community, led by the US, will exert heavy pressure on the Arab coalition, compelling it to accept a settlement that will re-establish the power-sharing system that emerged following the 2011 uprising. This scenario is extremely dangerous, as I mentioned before. It will be like remanufacturing a bomb that could explode at any moment. It will lead to an endless cycle of conflict. We hope to see developments that will spare our country, the Arab region and neighbouring countries all that. But as long as we have begun, we must not stop until we achieve our goals of building a Yemeni state, establishing permanent peace and stability, and eradicating forever the causes of conflict and civil warfare.